David’s son, Absolom, had beautiful hair. We read in 2 Samual that it was heavy and long and gorgeous. He cut it once a year and weighed it. If he made this big deal about his yearly hair cutting, I would image that he was extremely proud of his hair, don’t you? I’m sure it was a constant source of compliments for him. 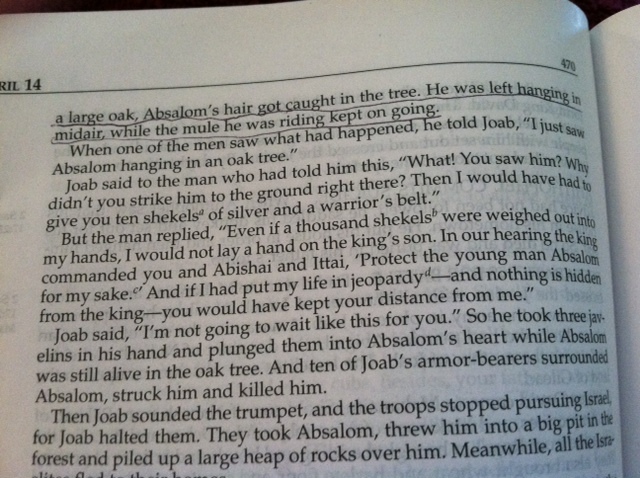 And then we read in 2 Samuel 18 that Absolom was riding his donkey under a tree in the midst of battle when his hair got caught in the tree. He was pulled from his donkey and was left handing in midair while his donkey just kept on going. Only really thick hair would be able to do that, right? While Absolom was hanging there, Joab plunged his sword into his heart and killed him. If Absolom had thin hair or even regular hair, this wouldn’t have happened to him. The thing he was so very proud of became a snare that caused his death. So the question to us today is – what is the thing in our life that we are most proud of? Do we need an attitude adjustment before we find ourselves in a snare? Are we already caught in a snare? Dear Father, we are so blessed to have you in our lives lavishing us with your mercy and your love. We confess our pridefullness. We need you. Please help us only be proud of you and what you have done for us.